[New for 2015] You know, every (hungry) morning on my way to the car, I think about grabbing a handful of today's review. I haven't left myself any ice cream bars or sandwiches that I can randomly grab on the way to work and I suspect these might do nicely. Hmmmmm. I don't want to rehash everything from the first review, but the gist is you get 12 in a pack and they are about the size of an Oreo (if it was like quadruple stuffed anyway). 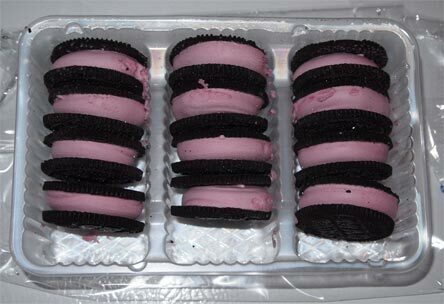 Actually, they are about the same calories as an Oreo as well. 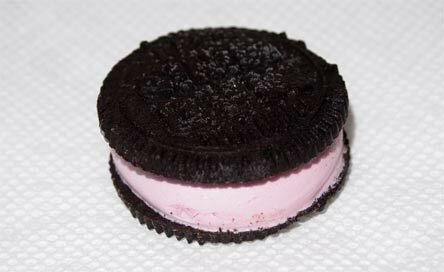 In this particular flavor we've got a filling with a mild purple color, but how will it taste? I take a bite, and while it takes a moment to kick in, well, the black raspberry bites back. It reminds me of something that I can't place on this first sampling. I want to say it's got the kick of a nice sherbet, but that might be the wrong word. Maybe like a tangy fruit filling on say those trader joe's dark chocolate covered raspberry things I tried earlier today. Yeah, that's what it reminds me of. At first I thought it was going to be some dainty raspberry as you really only taste the cookies at first, but then the blast of flavor hits you just like some fancy chocolate candy filling. Hmmmm. Interesting take Mad Minis. I did not expect that, I was expecting mild or maybe sweet like Friendlys, but not this. 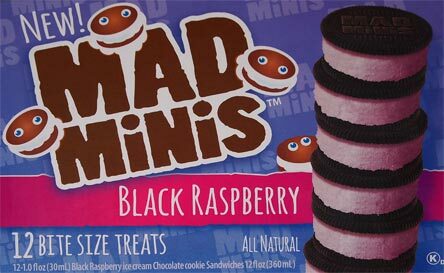 If anything, it leads me to believe that mad minis have the option for infinite possibilities with their flavor combos. Ok, two for now since it's late, but I'll be grabbing a few on the way to work soon enough. On Second Scoop: I still don't love-love the actual cookie wafers, I think they need a little more... texture difference maybe? But as a mini snack, these definitely have a fun factor. Nothing wrong with just grabbing two (though I have also tried enjoying four at a time). I think what I like most about this variety is not the flavor itself, but of the possibilities it opens the door for. With Oreo going crazy, there is room for a company like this to go nuts as well in terms of flavor combinations. Question is, do you expand your market first or do you expand your lineup first? I guess you just do your best balancing both. Anyway, buy a box, split it with some friends, and have fun of thinking of what flavor you would make next.